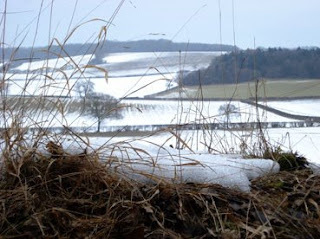 It is a cold February day and much of the snow we had over a week ago is still lying on the fields. The landscape is so very different with snow on the ground, all the trees and snowless areas seem so much darker to look at, there appears to be very little colour around. I've walked out from home and seen many deer today. When I look across fields and into woodland, the snowy ground between the trees makes deer loose their camouflage and they can easily be seen running off between the trees. Apart from the snow making their food more difficult to find - I found many places where deer had scraped away a covering of snow to get at the grass beneath. The snow must make them more vulnerable to predators or hunters. In one place I passed within about 20ft of two muntjacs standing motionless against a woodland backdrop. At any other time I might not have seen them, but today it seemed as though they had nowhere to run to. A patch of woodland beneath some scots pines hold my attention and thoughts for a period of time. I sit on the damp and cold earth against what I think was a small hornbeam. The ground is criss-cross covered with the long, double-stranded scots pine needles. Around me I also see small twigs, cones, hornbeam (?) leaves, moss, pieces of bark, deer droppings and bird droppings (from roosts in the tree above me). I scrape away a small patch of this surface litter to reveal the lower surface of finer decaying organic matter - about an inch deep above the actual soil level. I see a couple of centipedes and also a some new nettle shoots with fresh green leaves. A fine, long deep-magenta root reaches out horizantally into the surrounding woodland. How many of the tall dead nettle stems are linked I wonder? All poised to expand again with new spring growth. As I scrape away some more leaves I find some small creamy long objects which I at first assume are strands of some fungi. I then realise that they are small bones. I uncover more and find some vertebrae and they must have been about an inch long. Perhaps this was a rabbit at some stage. I don't find a skull, but I didn't want to disturb the earth more than I had to. 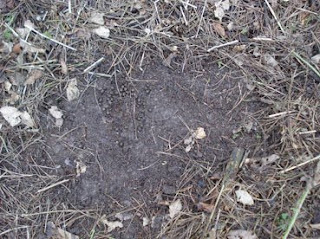 I find several deer scrapes made where deer have cleared a patch of woodland floor for a temporary bed. The ground is brown and almost lifeless under these trees. The leaves and wood look almost black in places. February can seem quite a dark month yet I know that it will imminently take on a whole new meaning and dynamic. I don't stay much longer as I have got cold. I'm dressed for a brisk walk today and not with warmer layers for sitting round in woods in a cold wind.